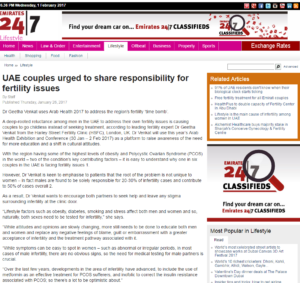 A deep-rooted reluctance among men in the UAE to address their own fertility issues is causing couples to go childless instead of seeking treatment, according to leading fertility expert Dr Geetha Venkat from the Harley Street Fertility Clinic (HSFC). Dr Venkat is using this year’s Arab Health Exhibition and Conference (30 Jan – 2 Feb 2017) as a platform to raise awareness of the need for more education and a shift in cultural attitudes. 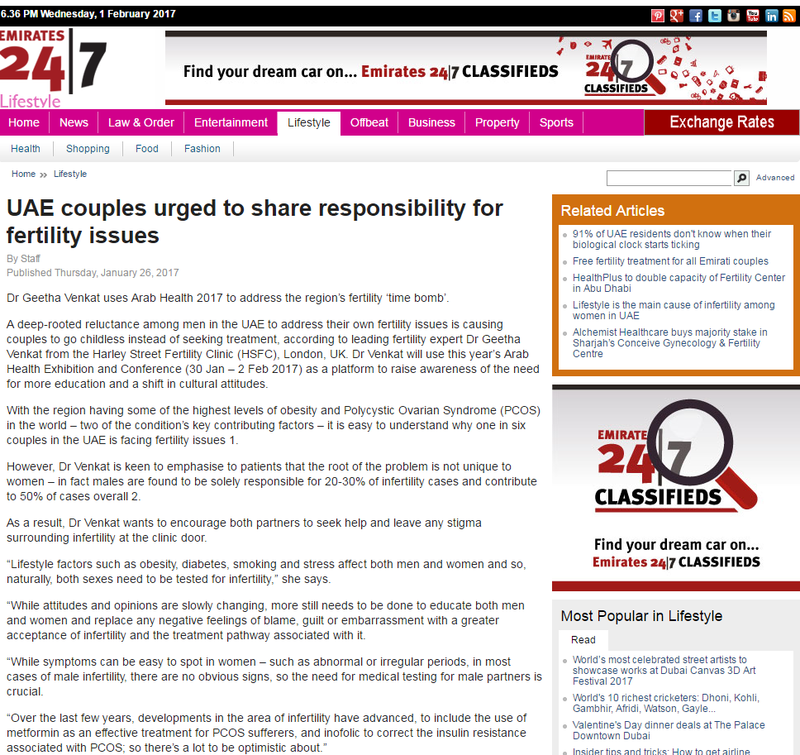 With the region having some of the highest levels of obesity and Polycystic Ovarian Syndrome (PCOS) in the world – two of the condition’s key contributing factors – it is easy to understand why one in six couples in the UAE is facing fertility issues1. However, Dr Venkat is keen to emphasise to patients that the root of the problem is not unique to women – in fact males are found to be solely responsible for 20-30% of infertility cases and contribute to 50% of cases overall 2. As a result, Dr Venkat wants to encourage both partners to seek help and leave any stigma surrounding infertility at the clinic door. “Lifestyle factors such as obesity, diabetes, smoking and stress affect both men and women and so, naturally, both sexes need to be tested for infertility,” she says. “While attitudes and opinions are slowly changing, more still needs to be done to educate both men and women and replace any negative feelings of blame, guilt or embarrassment with a greater acceptance of infertility and the treatment pathway associated with it. Dr Venkat who has more than 20 years’ experience in the field of fertility, is also using her visit to Dubai to forge potential partnerships with medical organisations in the region, in a bid to work together to develop the speciality and offer more hope to patients.